Paul Keres was an Estonian chess grandmaster, and a renowned chess writer. He was among the world's top players from the mid-1930s to the mid-1960s. Many chess historians consider Keres the strongest player never to become World Champion. He is the only player in history who managed to defeat nine undisputed World Champions. Content: 122 minutes of chess theory and discussion, with example games, over a series of 4 lectures. 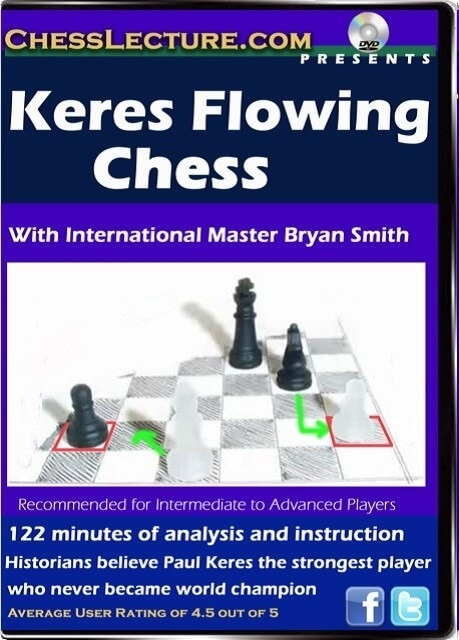 Members of ChessLecture.com rated this series a 4.5 out of 5 Fans on ChessLecture.com said: Wow, one of the best lectures on positional chess on the site! 47 minutes full of great ideas. That's how much time such a classic positional game deserves. FM Eric PetersonIM Bryan Smith: grew up in Anchorage, Alaska, and currently resides in Philadelphia, PA. Some of his accomplishments include clear first in the 2008 National Chess Congress, first place in the 2006 U.S. Masters (qualifying to the 2007 U.S. Championship) and first place in the 2008 King's Island Open, as well as winning many other Grand Prix tournaments. He was on the national champion UMBC chess team from 1999 to 2001. Bryan is the highest rated player ever from Alaska.